Today is the 97th Anniversary of the Battle of Loos and this image connections us with the tragedy of that day – the human cost in lives as the soldiers of both sides fell in their thousands on 25th September 1915. But this image is not of a soldier or a warrior, but of a little girl. Written on it is the legend ‘Returned From France after Battle of Loos’. 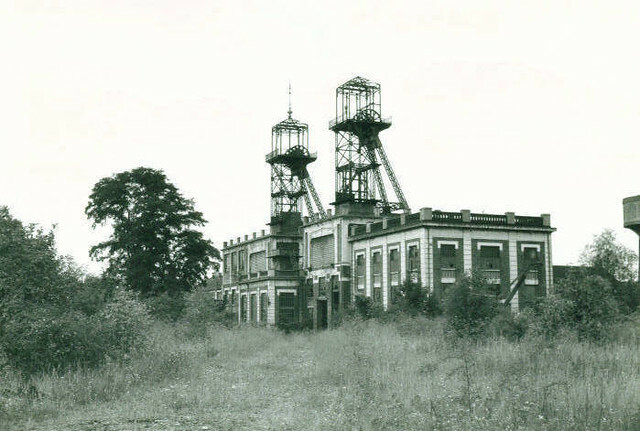 A postcard photograph, it was taken in Reading – where I bought it when I lived there in the early 1990s. The Royal Berkshire Regiment, the local unit to Reading, had several battalions involved in the fighting at Loos and it likely was the daughter of one of their men who went over the top that day. What happened to him? How did he become separated from this image? One veteran I interviewed recalled seeing postcards like this blowing around the battlefield, scattered from the pockets of men killed and wounded. Some soldiers picked them up, knowing how such treasures would be missed, and sent them back to local newspapers who printed them after big battles like Loos. 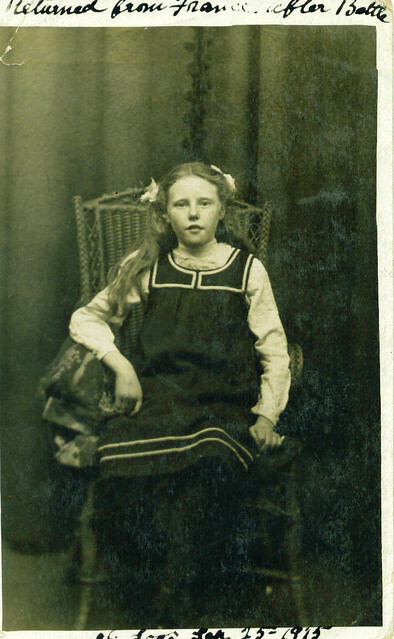 Whether this one was ever reunited with its owner or whether this young girl grew up without a father we will never know – but it remains a powerful image and a link to the tragedy the Great War caused. The Battle of Loos, which took place 97 years ago today, was the first time the British Army used poison gas on the Western Front: to spearhead an attack on the lines that was a joint effort with the French Army who were also attacking simultaneously at Vimy Ridge and in the Champagne. This image from a contemporary magazine shows Scottish troops being piped into action as they go Over The Top at Loos on the first day of the battle. Loos was very much a Scottish battle with some of the first wartime volunteers from the 9th (Scottish) and 15th (Scottish) Division taking part. 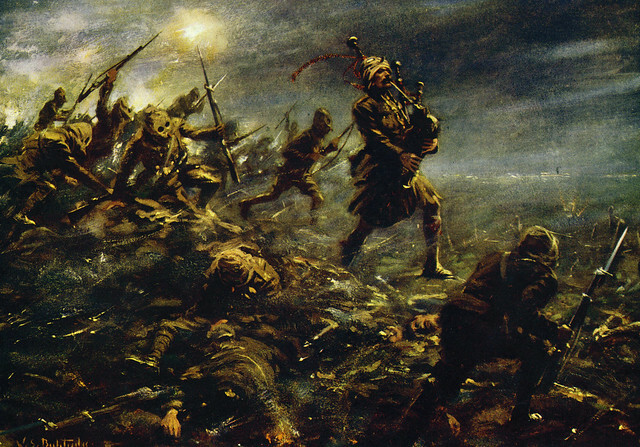 Regimental pipers in Scottish regiments played a key role in keeping the morale of the men up as they went into battle and Piper Daniel Laidlaw of the King’s Own Scottish Borderers was awarded a Victoria Cross at Loos for bravery as a piper. The gas used as Loos meant that British soldiers had to go over in their gas masks – at this stage the P Helmet, a hood like device seen being worn in this image. On parts of the British front gas blew back on the attacking troops, causing more casualties to British units than the enemy. We saw the other day some men of the London Scottish on the steps of their regimental headquarters in Westminster. They were about to depart for Flanders and by the Spring of the following year a high percentage of the London Scottish ‘originals’ had either been killed or wounded at Ypres, or had been commissioned as officers. Back in England first a second battalion and then a third had been formed and gradually they began to send out replacements. 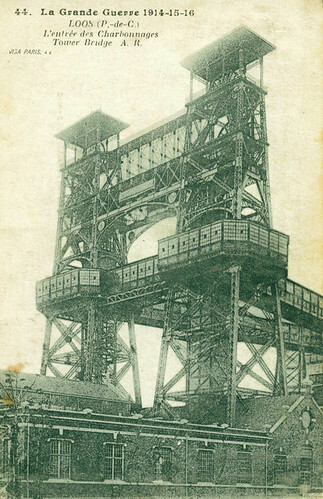 By now the London Scottish were attached to a regular division – 1st Division – and had moved to positions around the La Bassee canal in Northern France. 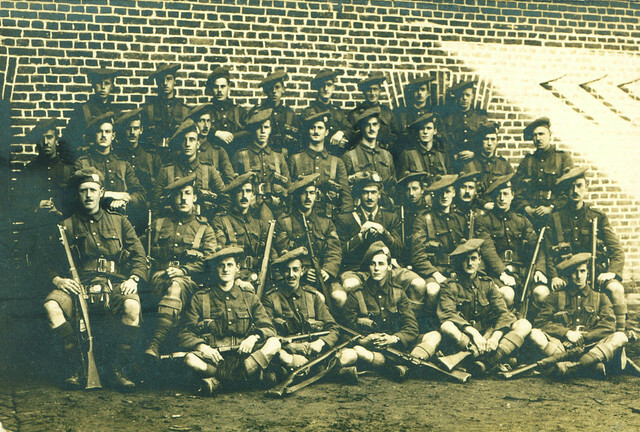 When this photograph of a platoon of the London Scottish was taken in August 1915 the battalion was now getting ready to take over positions on what would become the Loos battlefield and a few weeks after these men were filmed in the summer sunshine of a back area near Bethune, they would go Over The Top in the Battle of Loos, suffering heavy casualties around The Lone Tree. 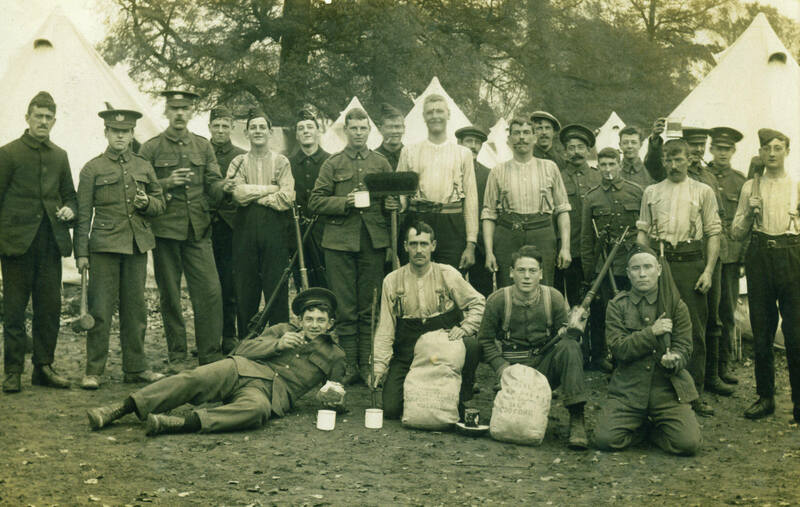 The men are all wearing their Tam O’Shanters and equipped with the Short Magazine Lee Enfield; the previous year many men in this unit had experienced problems with the older ‘Long’ Lee Enfield at Messines when rounds had jammed in the breach. They look a tough bunch and nearly a year after their famous action at Messines were a well known and respected regiment.